Spencer Fullerton Baird, the third of seven children, was born in Reading, Pennsylvania on February 3, 1823 to Samuel Baird and Lydia McFunn Biddle. The family relocated to Carlisle, Pennsylvania following the death of Baird's father from cholera in 1833. Baird entered the local Dickinson College as a freshman in 1837, receiving his A.B. degree in 1840. Following graduation, Baird attended the College of Physicians and Surgeons in New York for one year, but found that he had a dislike for the medical practice and returned to Carlisle to continue with his scientific studies. During this time, Baird married Mary Helen Churchill, and the young couple later had a daughter, Lucy Hunter Baird. Spencer F. Baird was offered a teaching position at Dickinson College in 1845 as professor of natural history, and became popular among the students for his practice of taking the young men out into the field to study the natural world. He became chair of both the departments of natural history and chemistry in 1848. Throughout his time as professor, Baird continued to write on subjects of natural history, quickly becoming a respected ornithologist, zoologist, and naturalist. In 1850, Baird accepted a position as Assistant Secretary of the Smithsonian Institution in Washington, D.C. Reportedly two freight cars were required to transport his collection of birds, lizards, fish, skins, and skeletons, weighing a total of 89,000 pounds, from Carlisle to Washington. Many of these specimens can still be found in the Smithsonian Museums. 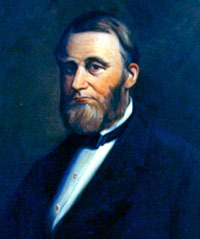 Upon the death of Joseph Henry in 1878, Baird succeeded him as Secretary of the Smithsonian Institution. In addition to this post, Baird also served as Director of the National Museum from its founding until his death and as Secretary of the American Association for the Advancement of Sciences. He was an early member of the National Academy of Sciences and served as a trustee for the Corcoran Art Gallery, Columbia University, and Dickinson College. In 1871 Baird was appointed the first U.S. Commissioner of Fisheries by President Ulysses S. Grant, and he held that position until his death in 1887. This position led Baird to spend a great deal of time in Woods Hole, Massachusetts as he was responsible for overseeing the founding of the Marine Biology Laboratory there. Spencer Fullerton Baird died at Woods Hole on August 19, 1887 and was laid to rest at Oak Hill Cemetery in Washington, D.C.